The human body contains chemical compounds, such as water, carbohydrates (sugar, starch, and fiber), amino acids (in proteins), fatty acids (in lipids), and nucleic acids (DNA/RNA). These compounds from the periodic table, in turn, consist of elements such as carbon, hydrogen, oxygen, nitrogen, phosphorus, calcium, iron, zinc, magnesium, manganese, and so on. All of these chemical compounds and elements occur in various forms and combinations (e.g. hormones/vitamins, phospholipids, hydroxyapatite), both in the human body and in organisms (e.g. plants, animals) that humans eat. The elements and compounds are ingested, digested, absorbed, and circulated through the bloodstream. Classified as "macromineral" dietary minerals are required in relatively large amounts. Conversely "microminerals" or "trace minerals" are required relatively in minute amounts. There is no universally accepted definition of the difference between "large" and "small" amounts. At least seven minerals are required to support biochemical processes, many playing a role as electrolytes or in cell structure and function. Dietary Reference Intake from the Institute of Medicine of the US National Academy of Sciences recommends for human nutrition, the dietary bulk "mineral elements" > 200 mg/day. A variety of elements are required in trace amounts, unusually because they play a role in catalysis in enzymes. 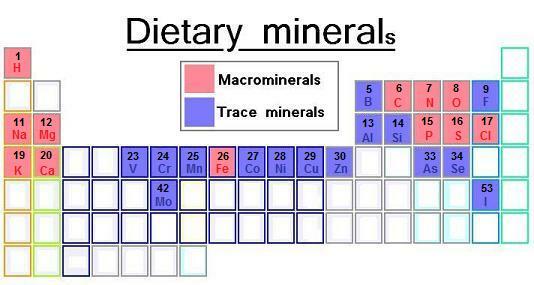 Dietary Reference Intake from the Institute of Medicine of the US National Academy of Sciences recommends for some trace mineral elements < 200 mg/day. Many elements have been suggested as required in human nutrition, but such claims have usually not been scientifically proven. One problem with identifying efficacy is because many elements are harmless at low concentrations, so proof of efficacy is lacking. Definitive evidence for efficacy comes from characterization of a biomolecule with an identifiable and testable function. Of the many trace elements still lacking solid proof, chromium is often cited. Chromium (III) is implicated in sugar metabolism in humans, leading to a market for chromium picolinate. The body's requirements vary widely. At one extreme a 70 kg human contains 1.0 kg of calcium but only 3 mg of cobalt.